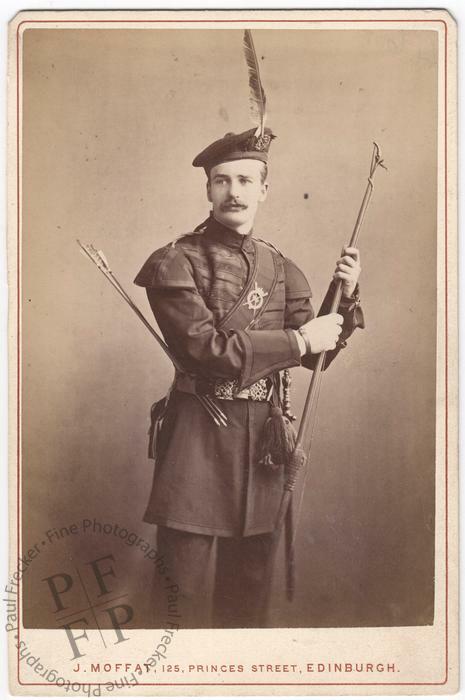 A cabinet card portrait of John Hamilton Gillespie (1852-1923), seen here wearing the uniform of the Royal Company of Archers, the sovereign's bodyguard in Scotland. ‘Ham’ Gillespie was born at Moffat in Dumfriesshire on 14 October 1852, the son of Sir John Gillespie, head of the Florida Mortgage and Investment Company. He studied law at St Andrews and served as an officer in the Volunteer movement, joining the 1st Midlothian Artillery as a Sub-Lieutenant on 23 May 1877. On 10 October 1878 he was promoted to the rank of Lieutenant and on 14 March 1883 he attained the rank of Captain. He resigned his commission on 14 February 1885. The following year he was sent out to Florida to manage his father's concerns there. He built the DeSoto, the first hotel in Sarasota, and laid out a golf course there, one of the first in the United States. He served as the first Mayor of Sarasota, and was subsequently re-elected a further five times. He died on 7 September 1923 of a heart attack, while playing golf on the course that he had built. Photographed by John Moffat of 125 Princes Street, Edinburgh. Condition: the print presents a few small dark marks in the area of the background but is otherwise in excellent condition, with good tonal range. The mount is clean, firm and solid. An inked inscription verso in a period hand identifies the sitter.